It may have taken a while, but it seems that summer is finally here in full swing. You may have already begun summerizing your wardrobe, but what about your home? Whether you love this sunny season or are already waiting for the heat to die down and the leaves to change colors, there are a few things you should do in order to get your house ready to stay cool and keep it stylish. There’s nothing more pleasant than being able to invite some fresh air into your home on a cool summer night. In order to let the air in but keep the bugs out, replace the glass on you storm doors with screens. If you’re using a screen from last year, replace any holes so you don’t spend the evening swatting flies! Chances are, you’ll be entertaining at least once this summer, so make sure your patio is ready to wow your guests. Clean up your outdoor lounge furniture, make sure your grill is in working order and maybe even decorate a little bit. Hang some string lights, invest in some citronella torches and sweep the area. Windows get caked with all kinds of grime in the fall, winter and spring. From rock salt, to dirt, to pollen, you probably don’t even realize that these things are hindering sunlight from filling the room. A quick wipe with cleaner will make your windows look pristine and allow your home to get all of the light possible. 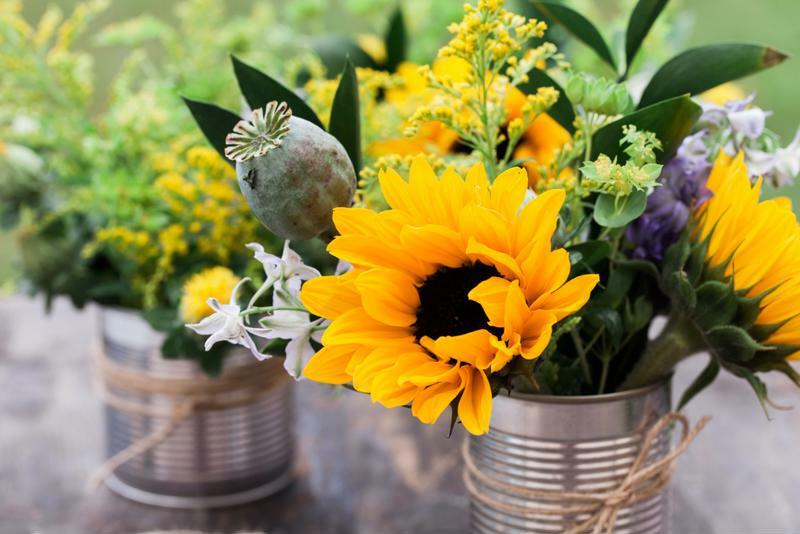 Whether you’re picking them from your garden or just buying a bouquet at the weekly farmer’s market, decorating your dining room or coffee table with some fresh flowers is the ultimate way to spruce up a space and give it a summery vibe. Opt for seasonal flowers like sunflowers, tulips or peonies. Decorate your home with summer flowers. Wool or shag rugs can be awesome to keep your feet warm in the winter, but they can be pretty miserable to walk on when you’re already warm in the summer. Consider switching to flat woven floral rugs or even nixing the rugs in general. Walking on cool tile or hardwood floors during this sweltering season can feel great against you feet. Don’t bother leaving that big heavy winter quilt on your bed this summer. It’s beneficial to have a set of winter linens and lighter, airy summer linens. Opt for white or pastel colors and a lightweight duvet. Your bedroom will feel like a heavenly summertime haven. While you’re at it, switch the decorative pillows in your living room out for lighter colors too. Avoid throwing dust all over the room when you turn on your fans by giving them a quick wipe down before you use them. Wipe them with a dry dust cloth and then a wet one to make sure you got everything off. If you use an oscillating fan, simply open it up to get to the fan blades. This will ensure you keep cool without sneezing! If you won’t be home during the day to enjoy the rays of sunlight peering through your windows, close your blinds or curtains. This will cut down on the heat that permeates through your windows all day, lowering the temperature in the evening. If you start doing this, you might not even have to bother switching on your air conditioner, which will save you a lot on your energy bills!